Objectives. Malaria is a life-threatening parasitic disease, transmitted by mosquitoes. In 2008, 243 million malaria cases led to about 863000 deaths, a slight drop from 2006 statistics. This slight drop in mortality resulted from a number of improved policies: increased international funding for research and healthcare, provision of insecticide-treated bednets, and a revival of support for indoor residential insecticide spraying. Despite this slight drop, challenges like drug resistance, the global financial slow-down and changing climatic conditions pose a threat to malaria control efforts. Mathematical models continue to play a major role in studies of malaria transmission dynamics and control. Although existing models have advanced our understanding of malaria, new models are urgently needed to capture new challenges to malaria control. Of note, there are increasing reports of malaria even in places where it had been eradicated. A model that captures mosquito dynamics with respect to current climatic changes, incorporates the use of a potential vaccine, and reflects the economic burden of the malaria-afflicted nations can inform policy makers on the most effective combination of control tools. Such a model can therefore help to reduce the malaria burden significantly, as well as contribute to finding a means to eradicate malaria in the near future. This workshop brought together experts in the mathematics and biology of malaria dynamics to discuss cutting-edge approaches to modeling malaria transmission and control, with the goal of forming a global Working Group to develop a model that will incorporate pertinent workshop questions. How effective are present malaria control measures? What can be done to eradicate malaria in the near future? Can we generate a timeline? What is the current state of things with malaria modeling? How do we capture the dynamics of the mosquito population to reflect climatic changes and global warming issues in order to produce an accurate model that represents the dynamics of the vector population? What is the most realistic combination of control schemes that take into account feasibility and the health and economy of endemic areas most affected by malaria? Will control mechanisms be more effective if based on the make-up of the population at risk- for instance genetic makeup and other physical properties such as high attractants to mosquitoes? What factors are more pertinent to consider in this regard? How can vaccines be effectively captured in a malaria model that addresses questions 3 and 4 and can advance and provide answers to question 1? Summary Report. Malaria, a life-threatening mosquito-borne parasitic disease, caused an estimated 225 million clinical cases and 781,000 deaths in 2009. Challenges like drug resistance, the global financial slow-down, changing climatic conditions, and gaps in transmission dynamics data availability pose a threat to malaria control efforts. 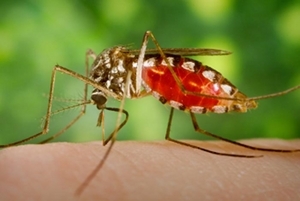 This three-day workshop brought together experts in the mathematical and biological sciences to discuss possible novel approaches to modeling malaria transmission dynamics and control in view of the challenges threatening the ongoing malaria control efforts. There were six talks, four on day one and two on day two, and in addition a poster session on day one. The talks were as follows: (1) The current focus for malaria control- what has worked well and (2) The future direction in malaria control and the challenges anticipated, both by Dr. O.A.T. Ogundahunsi of the World Health Organization (WHO), who gave participants great insights into the current malaria problem from the WHO perspective, including the global burden, challenges, gaps in research, and how the participants could contribute based on their diverse experiences and expertise; (3) The development and validation of the climate based early malaria epidemic prediction models in East Africa by Dr. A. K. Githeko of the Kenya Medical Research Institute, who highlighted the need to consider local and micro-geographic conditions in designing effective models; (4) Modeling the spread of malaria by Dr. S. Del Valle of the Los Alamos National Laboratory, who discussed the role of mathematical models in developing epidemic simulation systems and highlighted a new model that can capture spatial and demographic characteristics in order to develop targeted interventions; (5) Climate change and malaria transmission: Are there reasons to worry? by Dr. E. J. Muturi of the University of Illinois at Urbana-Champaign, who gave insights into how climate change (mainly temperature and rainfall) affects the dynamics and maturation of the mosquito that transmits malaria; and (6) A new approach to modeling malaria dynamics with focus on the mosquito population by Dr. G. A. Ngwa of the University of Buea, Cameroon, who highlighted the importance and role of the demography of the mosquito vector that transmits the malaria parasite, and presented results from a recently developed mathematical model of the largely neglected in-vector stages of the malaria parasite. Talks on the first day were followed by discussions in which workshop participants identified specific questions to be addressed. These questions were grouped into five major sections that led to the formation of five small groups based on interest. These groups were as follows: Mosquito dynamics; Malaria transmission dynamics; Data collection systems; Social issues associated with malaria transmission; and Drug resistance. Deliberations immediately commenced within each small group and continued until the end of the workshop. At the end of the workshop, summary presentations of subgroup ideas, work in progress and future plans were made by a designated member from each subgroup. All subgroups agreed that participants keep in touch. The future plan is to form a global Working Group to develop a model that would incorporate and address pertinent workshop questions.